A fun project created by Shannon Glazer. The popular owner of the Sunspot Cafe passed away in March. This was a short item, but it ended up catching a lot of traffic via search. Three Chicks and a P won this year's grant. Also popular: Whole Foods is coming to Albany | Oh, Whole Foods, why Colonie Center? People really love strawberries, apparently. 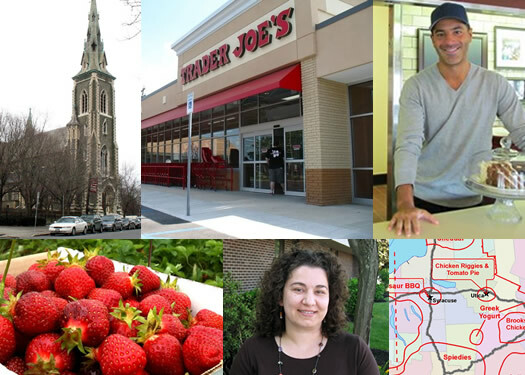 July: The recipe for a juicy rumor -- or, Did you hear the one about Wegmans and Albany? Again, supermarkets -- but it wasn't really about supermarkets. It's like everyone has to eat or something. Another one that charted because of search. New (fill in the blank) is almost always popular. Add Matt Baumgartner and partners, and it's very popular. Daniel's ode to the Buffalo wings at the Ruck in Troy. A bunch of local bloggers on their favorite local foods of 2012. A quick note: We filtered out regular features such as the Neighborhood and Stuff To Do. Also, some things that are spread out over multiple posts -- like the Tournament of Pizza -- don't end up ranking as high as they would if totaled all together. Here's last the list from 2011. Hmmm. 10 out of 12 were restaurants, grocery stores, and food...interesting. Nice job Shanny on your Febuary hit story! That's it?! Either you guys have to expand your horizons a bit or this area is BORING as all get out. Not surprising. AOA's audience has our priorities. I had heard Cardonna's was supposed to have an added location at the former Sunspots on Quail? Albany has a food problem. Even the supposed Godsend of Trader Joes is rather mediocre, blending in perfectly with the city has a whole. One only has to travel elsewhere just to realize how unambitious this place as a whole seems. One good coffee spot on Lark that knows how to make coffee. It is my civic duty to not mention the name in the hopes that you will provide business to other cafes to find it. Only one place knows how to not over heat the milk. Its a must try to believe. Back where I'm from, people shun Starbucks not out of snobiness, but out of real taste. I hope Albany has a whole tries to improve itself, it is embroiled (largely) in a culture of not trying and not being in competition, a la NYC. If you are a bad restaurant, you'll be gone ASAP. Here, you'll do just fine. Please, Albany-ians, it's never too late to try. @KA - Welcome to Team Fussy, it's great to have you aboard.